When the mainsail is raised on a sloop, the sail itself holds up the boom. As the mainsheet (and optionally, a boom vang) pulls down on the boom, along with gravity, the sail is pulled taut. But when the sail is lowered, the topping lift on most sailboats holds up the boom. Otherwise, the boom would fall down into the cockpit, becoming a hazard to people there and stressing the gooseneck that connects the inboard end of the boom to the mast. On some boats, the topping lift is fixed, having been set to hold the boom up when the sail is lowered but not so tight that it pulls the boom up when the sail is raised. For sailing, the boom should drop low enough to pull the sail tight. Often the topping lift is adjustable, however, allowing the sailor to raise the boom higher out of the way with the sail down and to ease the process of reefing the mainsail. In two situations you might want to tighten the topping lift such that the weight of the boom is supported by the topping lift rather than the sail itself. First, as previously mentioned, when you are about to lower the mainsail, you can tighten the topping lift to hold the boom up higher out of the way. The second reason to tighten the topping lift is to prepare for reefing the mainsail. Reefing is the process of lowering the mainsail partway, to a reefing point, to use less sail area when the wind is blowing harder. Tightening the topping lift provides more slack in the sail itself, making it easier to lower the sail part way and secure the reef. After raising or reefing the sail, however, it is necessary then to loosen the topping lift so that the weight of the boom pulls the sail tight. In the photo shown here, the topping lift is still too tight, causing bagginess in the bottom of the mainsail. This makes the sail very inefficient for sailing. With the mainsail fully raised or reefed, the topping lift should be just loose enough so that the boom pulls the sail taut. As shown in this photo, the topping lift now is looser and hangs limply on the near side of the sail’s luff (the trailing edge). The boom pulls down on the sail rather than against the topping lift. This allows the mainsail to achieve a good shape and to be trimmed well for sailing at different points of sail. The topping lift should not be so loose that it flops around and may get snagged on sail battens or other rigging. 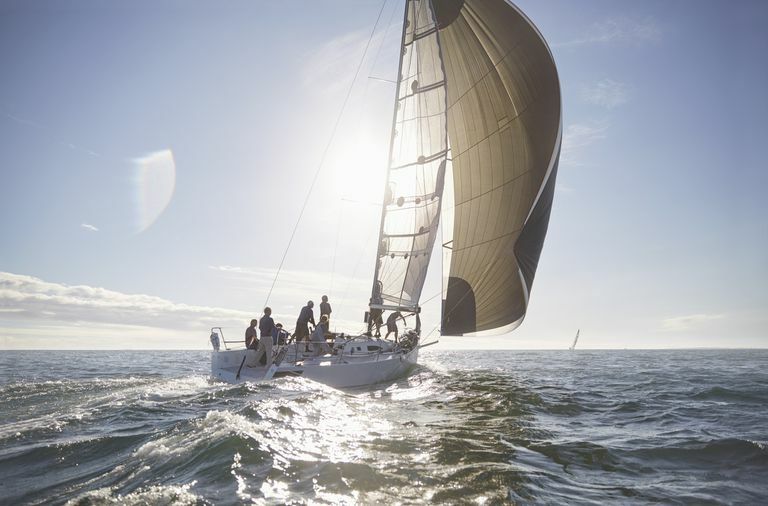 Being just a little loose offers another advantage: if you forget to tighten it up before lowering the mainsail, the boom will not drop as far down—with less risk of hitting someone’s head!